Politics in Venezuela has been in the news, and there seems to be at least some reason to suspect that the United States government is, once again, trying to overturn the elected government of a South American country, as the United States has done a number of times in the past. That is certainly what Venezeulan President Nicolas Maduro believes. With no apologies for the government of President Maduro, and without stating what I think about the likelihood that the United States is, once again, living up to its bad reputation, I would like to focus on a column about Venezuela that appeared in the Sunday, January 27, 2019, edition of the Santa Cruz Sentinel. As I say, this phenomenon is not uncommon in politics (it is sometimes called "revolution"), and the United States is not immune. There is a physical analogue for this kind of change, too (change that is so slow it doesn't seem like any change is occurring at all... with demonstrable and radical change then happening so rapidly that it doesn't seem like there was anything that came before). 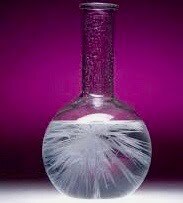 I invite your study of supersaturated solutions. Clicking this link will get you to a very understandable explanation of the phenomenon, which pretty much appears miraculous when witnessed. Certain solid materials are soluable (salts are a good example), and the ability of a liquid to dissolve a soluable material depends on the temperature of the liquid. When a liquid is "hot," there is more room between the molecules in the liquid, leaving more room for the molecules of the solid to find a place to reside. So.... if you heat up a liquid and then dissolve the solid in that liquid until the liquid will take no more, and then let the liquid cool down, the solution when cooled will be "supersaturated," holding in suspension (invisibly) more of the solid material that it actually can accommodate. The slightest disturbance to the liquid, once cooled, will precipitate the solid material out, extremely rapidly, and the result is something like what you see in the photograph at the top of this blog post. As I say, it is amazing to see this done. And in the realm of our political life, these kind of occurrences seem amazing, too. "Miraculous" and "revolutionary" political events do precipitate out of political conditions that seem not to be susceptible to any genuine change. This sends, of course, both a hopeful and a cautionary message, when we think of such changes in the realm of politics. Former Secretary of State Madeline Albright is warning us about the dangers of fascism suddenly appearing in our country; some more hopeful scenarios are also well within the realm of possibility. To my mind, the political lessons of the supersaturated solution are two: (1) First, we should never let ourselves be convinced that the only thing that is "real" is what we currently see; political "miracles" do happen, as Hannah Arendt advises. (2) The key to what is going to precipitate out of a boiling political environment depends on what we stir into it. We had better be stirring into our politics a lot of love, tolerance, and good will, or what finally appears, precipitated in just a moment, will be a solid structure of hate, discrimination, and violence. Now, I think you have, right there, the message of Albright's book. At least, I hope that's the message, since I am saying this about her book without having read it!